A few weeks ago, we celebrated #WorldEmojiDay. At So Buzzy we launched our real-life chatbot, the Bryan-Moji. But there were also a lot of other companies that did not miss this opportunity. In this blog post we provide you with a good dose of World Emoji Day inspiration for the following editions ? 1. Puzzle with the town Evergem ? Some cities are still looking for a good social media approach, but the Belgian town Evergem has already found its source of inspiration. They made their inhabitants puzzle with street names. Those who were able to translate the combination of emoji’s, ended up with a street name of the town. Really nice! 2. The magic of Disney ? At Disney they also showed their best side for World Emoji Day. On their Twitter account they shared the story of Frozen in emoji style! The film lasts two minutes, but was clearly able to charm a lot of people. Look at the engagement of this tweet! 3. Nokia tells you how your day is going to be ? Fan of the Wheel of Fortune? 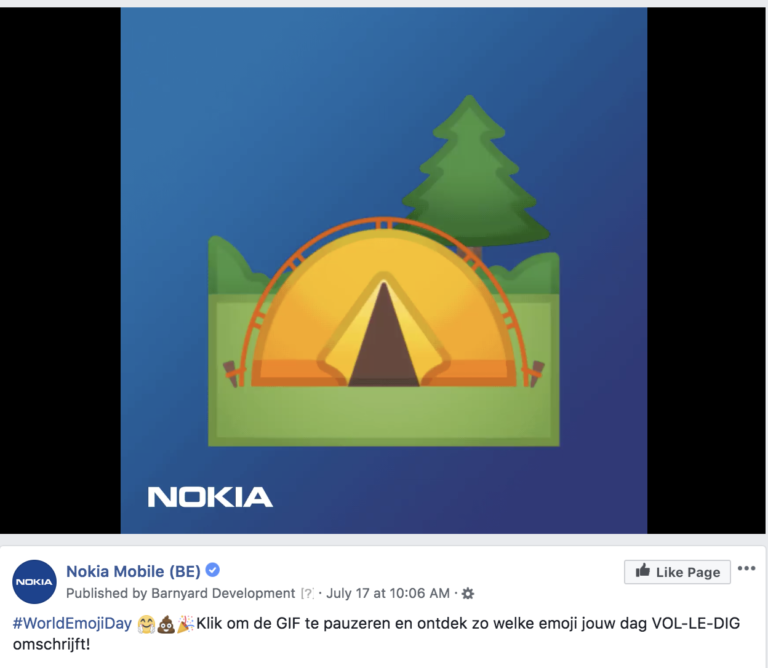 Then you will definitely be a fan of this post from Nokia! 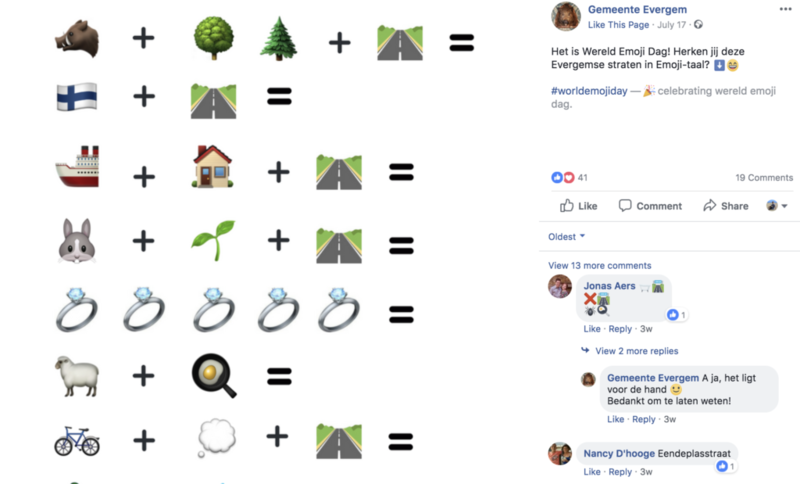 For World Emoji Day, they made a GIF that plays an order of emojis on repeat. The intention of the game is simple, press pause and the emoji that pops up describes your day. That’s something we wanted to try out. Sarah ended up with ✈️, which makes sense, because our office is close to Brussels Airport! Jana got a ?, lol! 4. 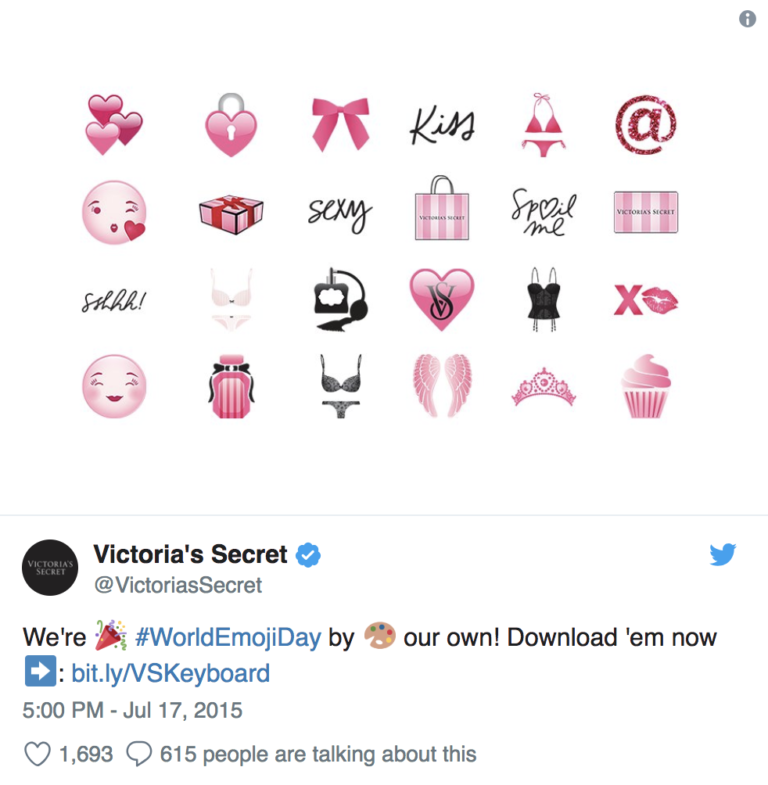 Emojis from Victoria Secret ? What is better for World Emoji Day inspiration than a brand that created their own emojis! That is exactly what Victoria Secret did. Very nice for all of their fans, and also good marketing. Victoria Secret definitely deserves a place on this list! 5. The Bryan-Moji from So Buzzy ? Billie from bol.com, Mr. More from Telenet and recently also Pierre Perron of the SNCB, nowadays you can’t avoid it: chatbots are everywhere. Coincidentally, a chat is now also the place where you use emojis the most. The ideal chance to take advantage of this, and so the Bryanmoji was born! The concept was simple: instead of a bot that gives preset answers, we used a person of flesh and blood, our Social Media Junior Bryan. Bryan was only allowed to respond with emojis. So, that was our list of fun posts on World Emoji Day, hopefully this inspiration gave you a boost for next year ? If you’ve seen another fun post on World Emoji Day, don’t hesitate to share your inspiration with us! ?